9th plate daguerreotype (2 x 2.5 inches, 5 x 6 cm). ±1850.. This is one of my favorite daguerreotypes. It is very small but still extremely detailed. Notice the stylish hair and the blush on her cheeks. A very interesting portrait indeed. I found the fingerless gloves curious. 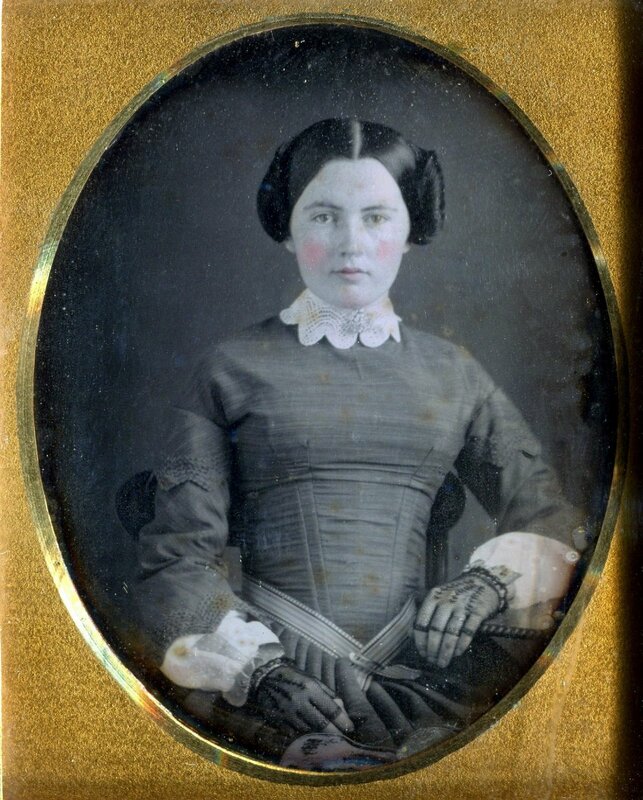 A wonderful daguerreotype image - thanks for sharing it. What a lovely portrait! thank you for sharing. Is she from your collection? What country is she from? I just discovered your blog, it is a pleasure browsing your posts! I live in the Netherlands too (not far from Amersfoort), and I also have a blog with historical finds, you might want to have a look, there are other Leia's in there too, for example on this post here: http://www.costumecocktail.com/2015/05/30/1101/. I hope you don't mind that I shared your photo from this blogpost.